1 Boil the kettle. Measure out 900ml of boiling water in a measuring jug, then crumble in the Knorr Chicken Stock Cube and stir to make a stock. Pour into a 3-litre saucepan over a medium heat and bring to the boil. 2 Using a sharp knife, remove the kernels from the corn cobs, then add to the boiling stock. 3 Cook for 3 minutes, then use a slotted spoon to transfer the corn to a medium bowl. If a few kernels get left behind, don’t worry. Turn the heat down to low. 4 Now, make the wonton dumpling mixture. Using a sharp knife, dice the chicken breast as finely as you can. Add the chicken to the sweetcorn, then wash the chopping board and knife. Stir in the soy sauce and sliced spring onions. 5 Break the noodles into the stock, turn the heat up to medium and cook for 3 minutes. Remove the pan from the heat. 6 Fill a small bowl with cold water. 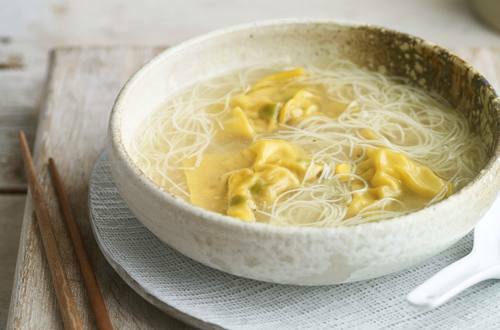 On a chopping board, lay out 3 wonton wrappers and place a teaspoon of the chicken and sweetcorn mix onto the centre of each. Moisten the edges of each wrapper, then fold one half up and over the filling to make a triangle, pinching the edges to seal. Place on a large platter, dusted with cornflour, as you go. 7 Working quickly, fill the remaining wonton wrappers in batches of 3. 8 Return the noodle broth to the heat. Bring to the boil, add 200ml of boiling water and the dumplings. Cook for 6 minutes. 9 Ladle into 4 bowls, making sure there are 3 dumplings in each. Finish with a drizzle of chilli oil.